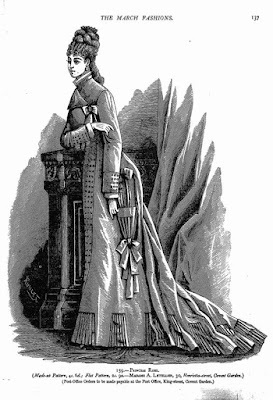 Every now and then, the subject of a conical-shaped pocket on a Victorian Natural Form Era dress pops up for discussion. Starting around 1875, but more prevalent in 1876, is what is commonly known as a cornet pocket (sometimes referred to as a parasol pocket). These pockets are quite beautiful, pleated, shirred, ribboned, buttoned, fringed and trimmed. 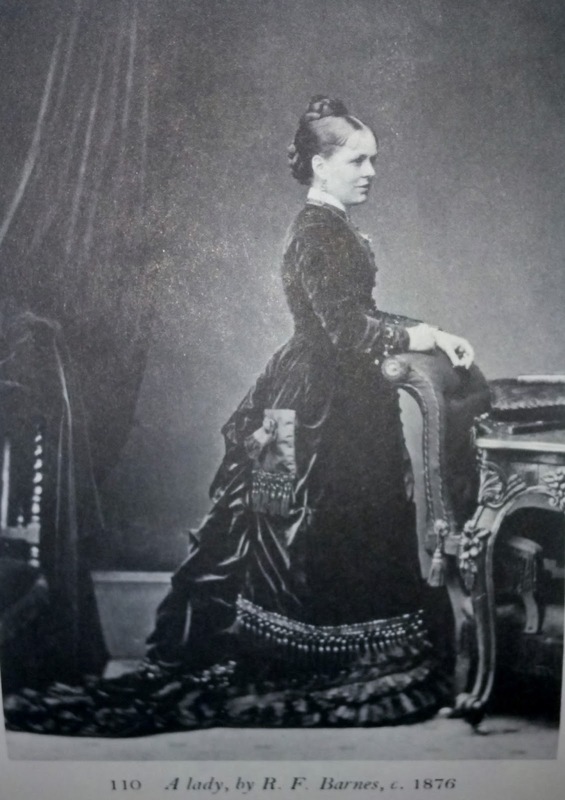 In doing a bit of research, I found a book entitled The History of Fashion in France by Mrs. Cashel Hoey and Mr. John Lillie written in 1882. 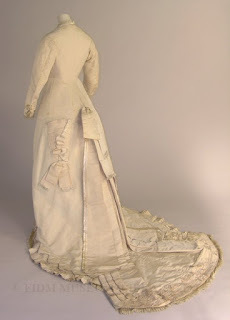 In part, it reads "In 1876, there was incredible variety in the shape of pockets: ......, there were "cornets," "hotties", and "corniers", all elegant articles of attire, beautifully made and embroidered, and fixed in various ways on the skirt." There was no mention of the term "parasol pocket" in this article, or in any other article I found. I do know of one fashion plate that refers to the pocket as such, but have not found any others. In the book "Victorian Fashions from Harper's Bazar" by Stella Blum, the subject of pockets again arises. 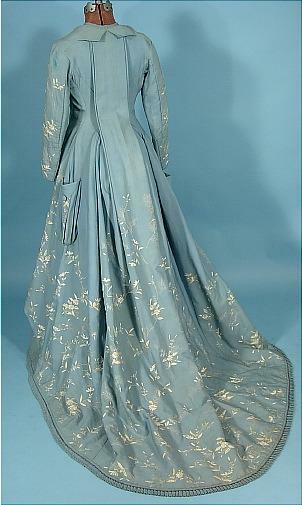 "Fashion History is dotted with occasional fads. In 1875 dresses developed elaborate pockets. 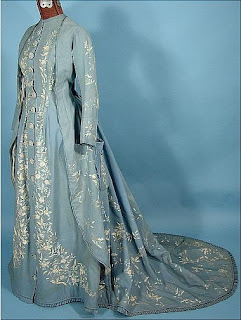 They became so popular that to be consistent with the new asymmetrical design of the costume, they survived as a single pocket placed so low and so far back that they were rendered impractical and were reduced to pure decoration. 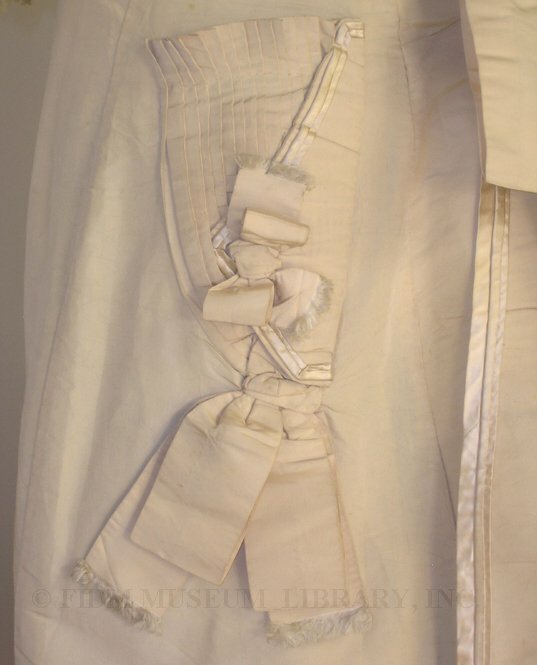 Although many dresses were made with these pockets for two years, there is no sign of their use afterwards." As we can see, this "parasol" shaped pocket can be nothing other than decorative. 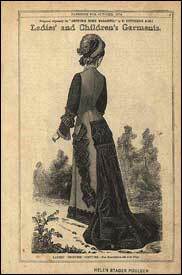 A bride would not walk down the isle with anything in her backside pocket other than maybe a small handkerchief. 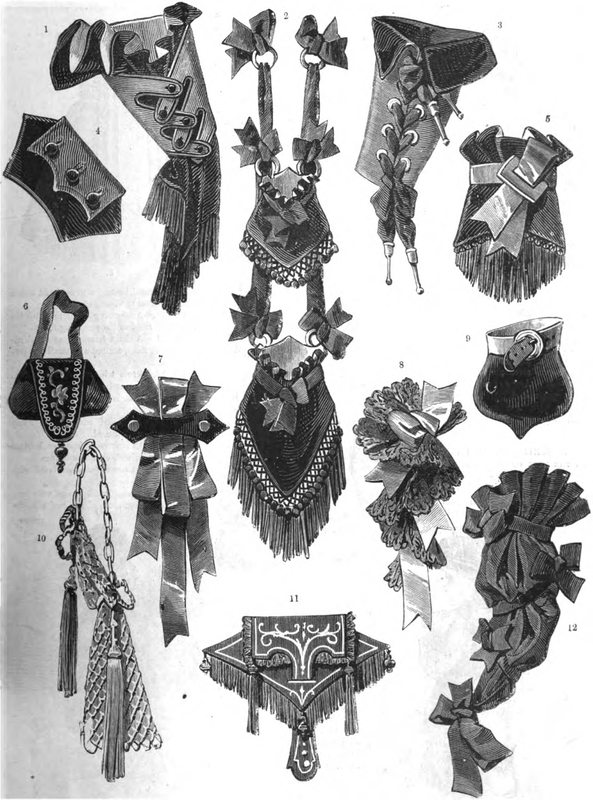 Above is an 1876 Victorian illustration of various other types of shaped pockets that may be attached to a skirt, by ribbons or by sewing it on. 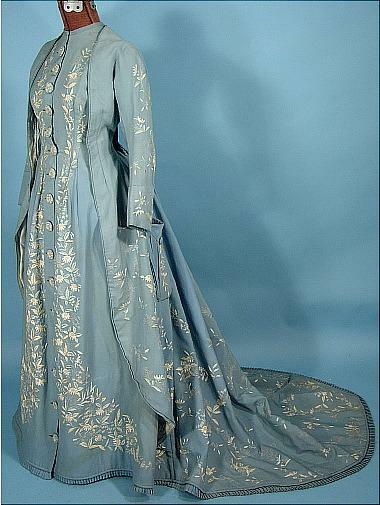 Pockets were also used on wrappers (house/morning dress) in the mid 70s, as seen on this beautiful trained pale blue wool gown with watteau back. (antiquedress.com) A shame this gorgeous creation was never to be seen outside the home! 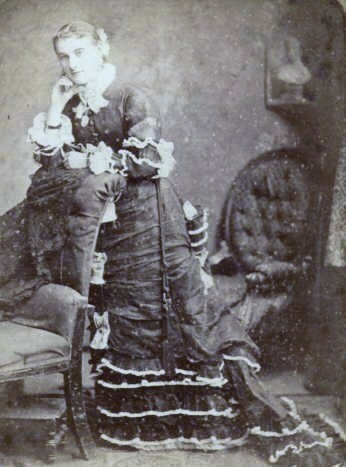 Right: A Lady by R.F.Barnes, 1876. 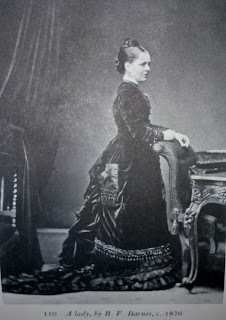 "Long velvet Princess polonaise (tunic and bodice in one) edged with fringe and with an ornamental pocket at the back." Yet another mention it was ornamental decoration. 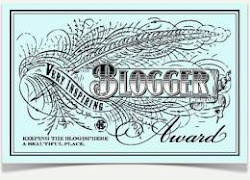 A good friend of mine, Trudy F, See her blog here was also interested in this subject awhile back. 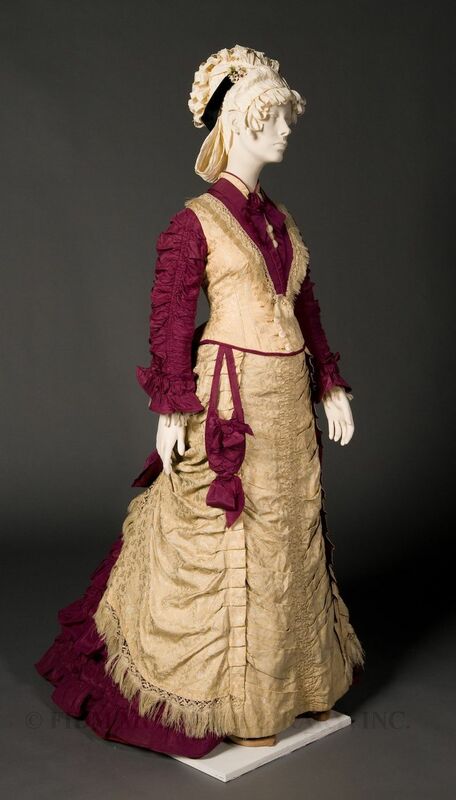 She contacted Kent State University and spoke with the curator of their extant gown collection, and asked if they had any gowns with outside pockets. They had three. The curator checked the pockets on the three and noted there was no visible wear on the inside or on the outside of the pockets. This leads us to believe nothing with any weight to it was held in them. Another indoor wrapper with the "parasol" shaped pocket. Quite large, with pretty ribbons. 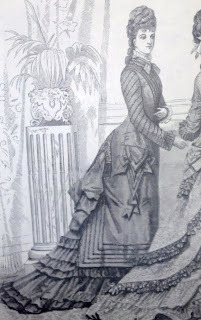 From a March 1877 pattern book. Princess Robe flat pattern, or as a made-up pattern by Madame A. Letellier, post office orders to be made payable at the post office, King Street, Covent Garden. 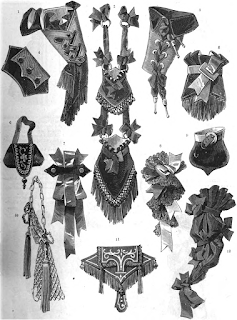 Several period photographs suggest these pockets were used for handkerchiefs, small fans and gloves. 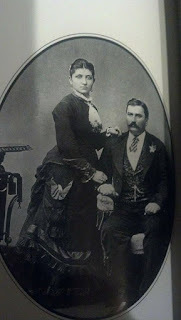 I have several more examples not posted here, showing a peek of lace handkerchief coming out of the top of the pocket. The book Victorian Costume 1860-1890 by Linda Setnik reads "Large ornamental pockets placed midway down the side of the skirt were also quite stylish, as well as practical for tight skirts (of 1876), making prominent an object which standard Victorian practice kept hidden within the side seams. Often only a solitary pocket was visible, reflecting the asymmetry beginning to creep into garments." 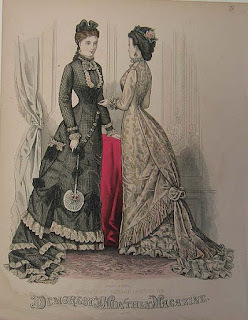 In the book "Stitches in Time: The Story of the Clothes We Wear" Author Lucy Adlington states: "In the 1870s there was even a brief fad for the flamboyant fan pockets of crinkled fabric on the outside of the skirt. A folded fan was slipped inside, with its decorative tassel on show." 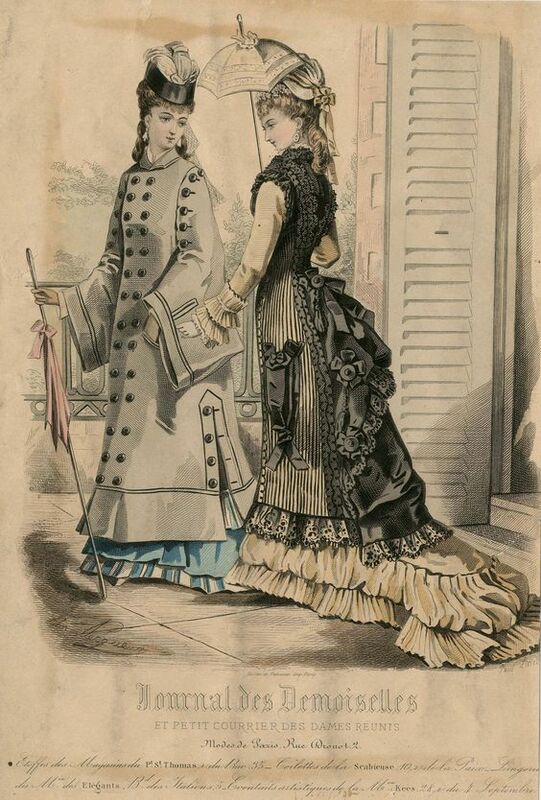 This pretty striped walking ensemble from Journal des Demoiselles 1876 shows a cornet shaped pocket which looks like it might be black silk. Its poofy, so may contain her handkerchief or other small item. Note the length of the ladies' parasols. 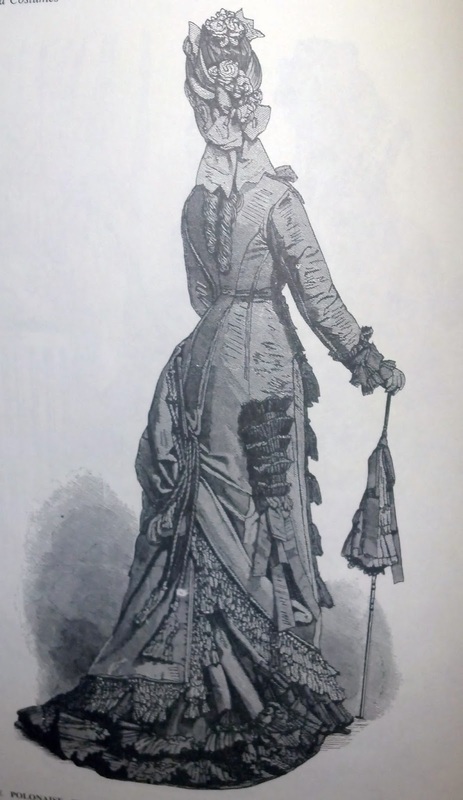 "Between 1865 and 1880 parasols lost their delicacy, handles became sturdy and bulbous and hinged sticks were no longer popular. From the middle of the 1870s sticks started to lengthen. Rustic style handles became popular in the late 1870s this fashion for gnarled wooden handles continued in vogue until the late 1890s. 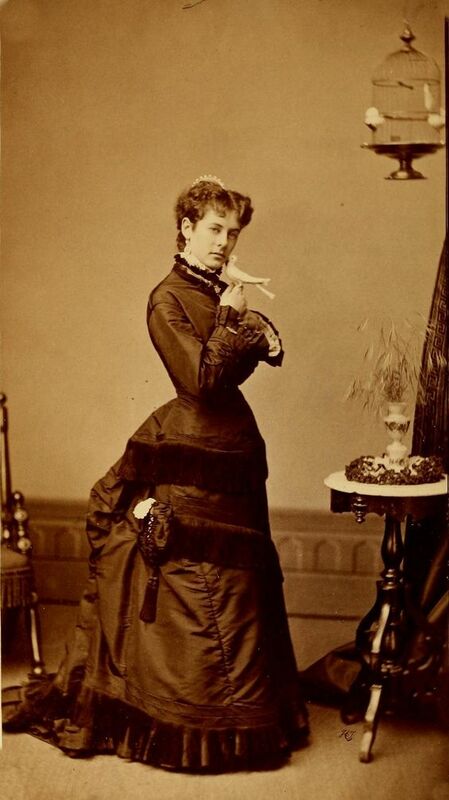 The cover of the parasol also changed and became slightly larger in the late 1870s". Kay Inverarity, director and costume consultant, B.A.Hist. Dip.Ap, sci. A pocket on this polonaise is described as "a large pleated faille pocket, in the shape of a cornet, is set on the side, and is finished with a knot of flowing loops and ends of faille ribbon." 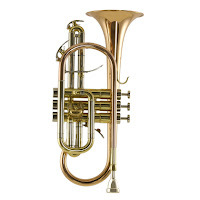 (Harper's Bazar 1867 to 1898) Again, this is called a cornet pocket as its named for the horn's graceful shape. This Harper's Bazar fashion plate describes the lady as having "large silk pockets with a ribbon bow." I continue to find more and more examples of pockets in books and online articles from historians and actual descriptions attached to fashion plates. Do you have an interest in a certain item or accessory? Spend some time researching it. Don't rely on someone's uninformed statement and believe it to be true. Research is fun! Awesome! 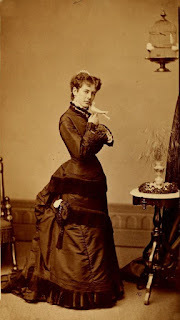 Sharing this on my Pinterest "Debunking Parasol Pockets" album. Excellent survey. This will go a long way to lay to rest a "reenactorism" that has been allowed to flourish for too long. Thank you Adam. I enjoy trying to get to the bottom of things. I found all this with just a small bit of research. THANK YOU! I think it started with a Karen Augusta dress that someone styled with a parasol in the decorative pocket sometime in the late 1990's and ever since then the beguiling idea of carrying a parasol on your person took hold. I'd like to drive a stake trough the heart of that as an historical fashion. It's great for fantasy. Thank you Miss Brilliantine! There is a photo, I can't recall just where (it may have been the Met site) where someone, possibly just the photographer, stuck a parasol in an extant gown, and voila! It must be true!